We’re hoping to reduce our expenses by moving to Mexico, but that doesn’t mean everything is cheaper there — not by a long shot. As a general rule, locally-produced items, including food, are cheaper than or at least similar to U.S. prices. Imports, on the other hand, are expensive … sometimes jaw-droppingly so. This article is long, so I’ll be posting it in three parts. Part one, below, talks about the prices we found that were crazy expensive. Part two will be comparably-priced foods, and part three will cover the truly cheap. My boy loves him some shredded wheat. He does this wacky thing where he adds boiling water, dissolving the biscuits and turning it into a hot cereal like oatmeal, which he then eats with butter and sugar. He started eating so much shredded wheat — four or more times a week — that I had to scramble to keep up. The regular prices on packaged cereal are just generally insane, and I refuse to pay them. No grain-based product should be three (or four, or five) dollars a pound. I found that I could get an 18-ounce box of shredded wheat for as low as $2, if I hit the right sale. I do feel a little conspicuous, walking around the store with a tower of eight identical boxes of cereal, but hey, it’s worth it to keep my sweetie happy. 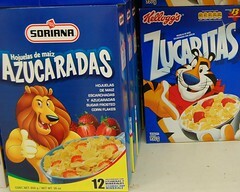 In Ajijic, we quickly learned that Mexicans do not eat as wide a variety of cereals as we Americans do. There are only about five or six types made in Mexico, all of them high-sugar low-fiber things like Froot Loops and Frosted Flakes that we have no particular use for. Anything else you want, you can probably get — but at import prices. 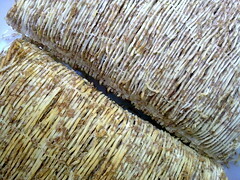 Best price we found on shredded wheat? 110 pesos, or about $8.50 per 18-ounce box. That, of course, was out of the question — I wasn’t even willing to buy it once, just for our visit. This wasn’t callousness, but the premise of the whole trip: we both had to behave as though we were really living there, on our proposed budget, and see if we could adapt. Jak took the lack of affordable shredded wheat hard, even listing it on his blog as the ‘second most difficult adjustment’ he had to make. We joked about instituting a Shredded Wheat Tax on future visitors: if you want to come stay with us in Mexico, bring cereal. But he made it through the month on oatmeal and eggs, and it doesn’t seem to have been a dealbreaker. Jak was worried about his daily routines like hot shredded wheat and coffee; I was worried about having enough variety month in and month out. As much as I love Mexican cuisine, I think I will need at least the occasional fix of my other favorites, Thai and Indian. So I went looking for some basic ethnic cooking supplies. Super Lake is the be-all and end-all of imported goods Lakeside. It’s not that big a store, but the owners cram a surprising variety of items in there. Expats in the area report that the manager takes requests — if you want something he doesn’t carry, he’ll do his best to get it for you. 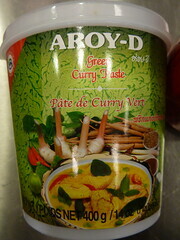 Thai curry paste was near the top of my oh-please-let-them-carry-it list. And they do! But for more than double the price: a 1000g tub is MX$142, or US$10.92. At the Asian supermarket near me, it’s $4.99 for the same amount. However, that much paste makes a lot of curry — maybe 50 large meals? — so if you think of it in cost per serving terms, the difference is only a couple of pennies. For the sake of variety, I can handle the increase. But when the expensive thing is not a spice but a staple, it’s a different story. I became an instant fan of basmati rice the first time I ever tasted it, at some Indian restaurant a couple of decades ago. Plain long-grain white never did much for me, no matter how you dressed it up, but nutty basmati — especially with butter and whole toasted cumin — was the bomb. For years now I’ve kept only brown and basmati on hand, plus occasionally some arborio for risotto. Basmati is more expensive than white, to be sure — I don’t even know how much, since I haven’t bought white in years, but I’d guess maybe by a factor of two. But even so, I can buy a ten-pound bag of basmati rice in Seattle for $10. In Mexico, the only store that imports basmati (again, Super Lake) charges $3.38 per pound. Arborio is even worse, at $3.80. Super Lake did have some brown rice for $1.65 per pound, which seems cheap compared to $3.38 but is still about double what I’m used to. Remember what I said above, about the insanity of paying over $3 per pound for grains? Still true. Personally, I can give up the risotto. But basmati? 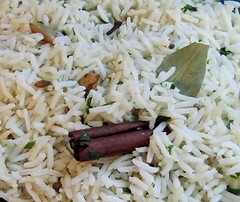 How can you have Indian curry without basmati? You might argue that an extra seventy-six cents per meal isn’t going to break the bank, but that is not the kind of thinking that’s gotten our grocery expenses as low as they are, nor that would allow us to live on even less in Mexico. So, I’m going to enjoy my basmati here in the States while I have it, and know that in a few years I’ll need to get used to plain old long-grained white. Other things can’t be had at any price. I looked everywhere for real maple syrup and never found any. This is a prime area of food snobbery for me; I will forego syrup altogether rather than use the fake stuff. And forego it I most likely will, because maple-flavored corn syrup is all I could find, even at Super Lake. Even if I could get it by special request, it would doubtless be off-the-charts expensive. Which is okay; I can switch to honey on my French toast. I love maple syrup, but it can become one of those things I treat myself to once or twice a year, when visiting the U.S.
That’s going to be the key to making this all work: adaptability. If I tried to keep our diet exactly the same, with shredded wheat and basmati rice and maple syrup and all the other things we’re accustomed to, we could end up spending even more per month than we do now. To keep our costs low, we’ll need to learn to substitute and to let go of old favorites. Next: Part two covers some comparable cost surprises from both directions. How much is direct shipping to there? Could you buy in bulk and hoard? I’m pretty sure that mailing bulk food purchases from the States to Mexico is impractical in both cost and logistics.